If I wanted to buy a premium fish finder for my fishing adventure, I’d get the Dragonfly 7PRO. After researching and reviewing a lot of fish finders, I am confident that the Raymarine Dragonfly 7PRO is your best bet in this price range. This device is a serious upgrade from other fishfinders out there. Not only did the fishfinder fit all anglers, but it’s also the best option for both fresh and saltwater boats. That’s why we have rated it as one of our top fish finders. The Raymarine Dragonfly 7 Pro is a great little unit that gives you dual channel CHIRP sonar and Chartplotter in one compact machine. The major improvement here is the dragonfly targeting sonar that has a depth range of 600 feet, which allows you to target fish anywhere under the boat. 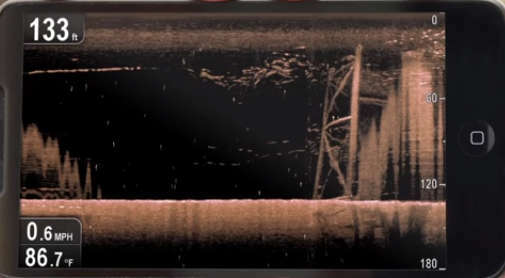 Another groundbreaking feature is the down-vision CHIRP channel that delivers photo-like sonar images and also allows you to see structures and fish targets up to 600 feet. The Raymarine Dragonfly is the best choice if you want a fish finder in five-hundred-dollar range. This unit gives anglers a lot for the money, making it a fantastic unit at this price range. The 7PRO flaunts a handsome and elegant design. The fit and fish of this fishfinder are just brilliant. Coupled with a compact design, lightweight and an excellent feature set, there’s a lot to like about the Dragonfly 7PRO. The all-weather display fishfinder is built to tackle the elements. So you are 100% sure that your device isn’t going to fog up in cold weather. Everything about the unit is controlled with just three buttons and a rotary dial. With a touch of a button, you can select between the pre-configured screens on this unit. You can quickly switch between your CHIRP fish targeting sonar, your GPS maps, and other split-screen combination. You can also use the joystick to press the type of screen you want. With its affordable price and size, the Dragonfly 7PRO is a great option for fresh and salt water boat. In fact, they were the only fish finder that made it into every one of our experts’ top three picks. That’s because the device performed excellently well in all of our tests. Using the color CHIRP sonar in GPS chart plotter, we could clearly see what was going on underneath our boat. We could see everything from fish to surface feeding pelagic like yellowtail tuna, marlin, and fishes of different sizes. Knowing where the target fish were holding in the water column and structures, helped us put our live bait in the right place for fish to get there. Also, operating this device is easy and straightforward. Once you turn it on, the next step is to start looking for fish. You don’t have to pass through the hassle of setting the device up. You can easily install it on any surface because the mount is easily adjustable, making it simple to position the device for optimal viewing. Compared to the previous version, the new 7PRO features a sharper and crisper high-screen resolution. The Dragonfly Bonded LCD provides you with brighter colors, high resolution, and sharper contrast. Unlike other Fishfinders that come with a 7-inch display that enables you to see underwater structures. The color screen Fishfinder also has a high-resolution display of 800 by 480 dimensions. You have no trouble seeing it out in the sunshine. What makes this bad boy different from others is its spectrum CHIRP technology. Dragonfly offers two distinct CHIRP sonar channels. The first one is the CHIRP fish targeting that scans directly below the boat with 25-degree cone angle. The CHIRP targets individual fish as well as bait. 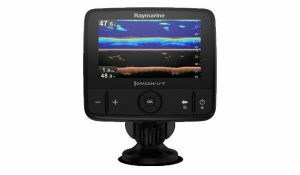 The Raymarine 7PRO second channel is the super wide 60-degree angle-chirp down vision mode used to portray structure in lifelike imagery. The down vision mode is ten times better than most of its competitors. We were able to see an enhanced detail of craggy bottoms while it still delivers excellent target separation between the fish and structures. We could pinpoint fish with incredible accuracy and with a fantastic sonar imagery. The Dragonfly 7PRO is more than just the sonar. The Dragonfly also comes with GPS built-in to help you navigate to your favorite fishing spots. It did an excellent job of offering a full-featured Chartplotter with a built-in 50 channel high-precision GPS. The charting systems are straightforward and easy to use. Setting your waypoints with the Chartplotter is a breeze. Even in fog or dark weather condition, the Chartplotter helps you to find your way around easily. The Fishfinder comes with a Wi-Fish mobile app that lets you use the device on your mobile phone. Once you download and install the mobile app on your smartphone, you can view, rewind or pause the Sonar right on your mobile device. If you’re looking for a bright, powerful, and simple to use fish finder, then the Raymarine Dragonfly 7PRO is the best choice for you. This particular brand comes with everything you’d want in a premium fish finder. The additions of premium features like Chartplotting, dual channel CHIRP sonar, packaged transom mount transducer and included Navionics blush, make this Fishfinder the best in the market. We highly recommend this unit for anglers who are looking for a fish finder that will enable them to spend more time catching fish and less time looking for them.